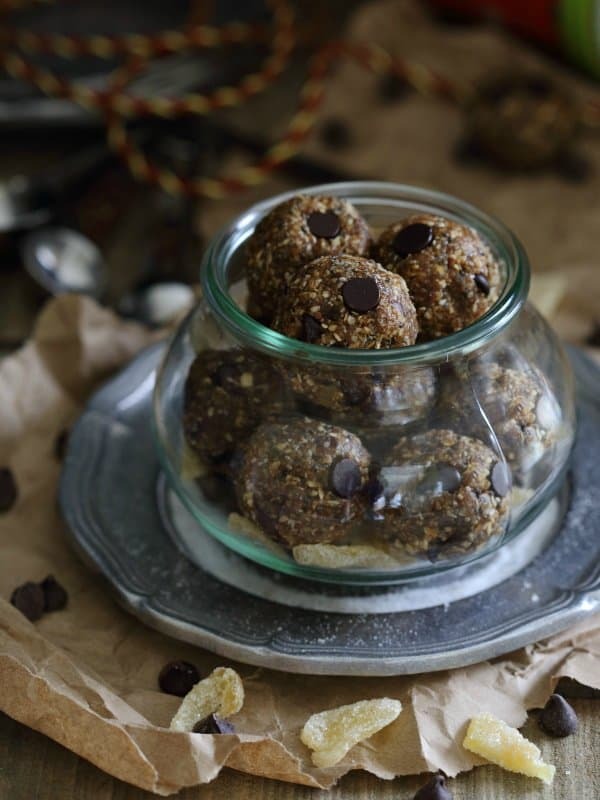 These gingerbread chocolate chip bites are a great no-bake, festive and healthy snack that come together in just 10 minutes. I used to make a lot of balls/bites/snacks rolled into circular form…whatever you want to call them. My favorite, however, is ballz. I would pop them throughout the day whenever I was (ironically) too busy cooking, styling. photographing other food to eat, before a workout, after a workout, while making dinner and starving, before bed as dessert, seriously…all the time. And then I just randomly stopped for no particular reason. But, I missed my balls. So earlier this fall I made pumpkin spice chocolate chip bites which seemed to be a big hit (and definitely were in my house as about 5 batches were made) and now, we’re doing gingerbread chocolate chip bites. If I thought I loved the pumpkin ones, these are even better. 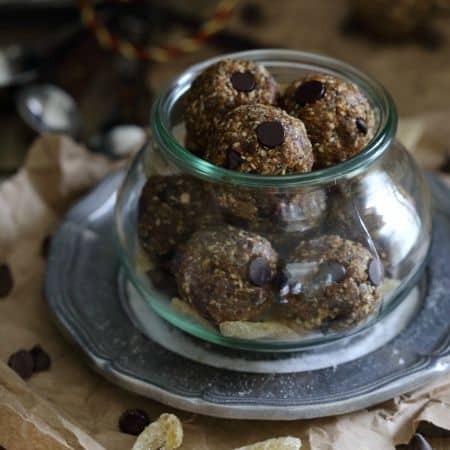 Gingery, spicy, chocolaty, chewy and (relatively) healthy! Honestly, I’d rather eat these than the loads of red and green food colored, candy stuffed cookie concoctions I’m seeing everywhere lately. Real food for the win. These gingerbread chocolate chip bites are a great no-bake, festive and healthy snack that comes together in just 10 minutes. Combine the oats, pecans and dates in a food processor and process until finely chopped. Add the crystallized ginger, flax, chia seeds, spices and molasses and pulse until fully combined and mixture can be "pinched together" and hold it's shape. Transfer mixture to a bowl and fold in the chocolate chips. Rolls the mixture into balls. AH! These looks so good! They are calling my name. Chocolate and gingerbread are just so perfect together! 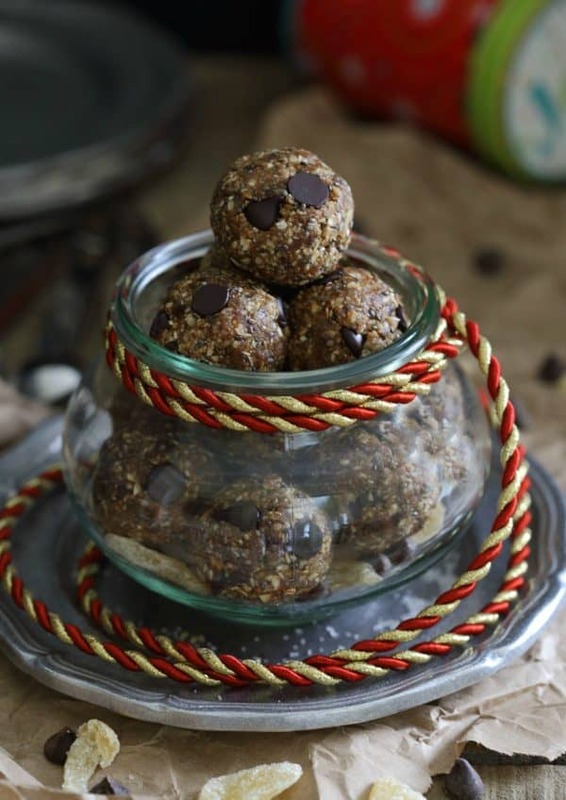 What a great way to make healthy treats festive! Pinned! Seriously they might as well make themselves a meal because I find myself eating energy balls all the time! But have yet to enjoy gingerbread. Need to get on it! Totally loving the no bake part of this recipe. I am always looking for quick snacks on the go. These look yummy, perfect for that mid afternoon snack!! 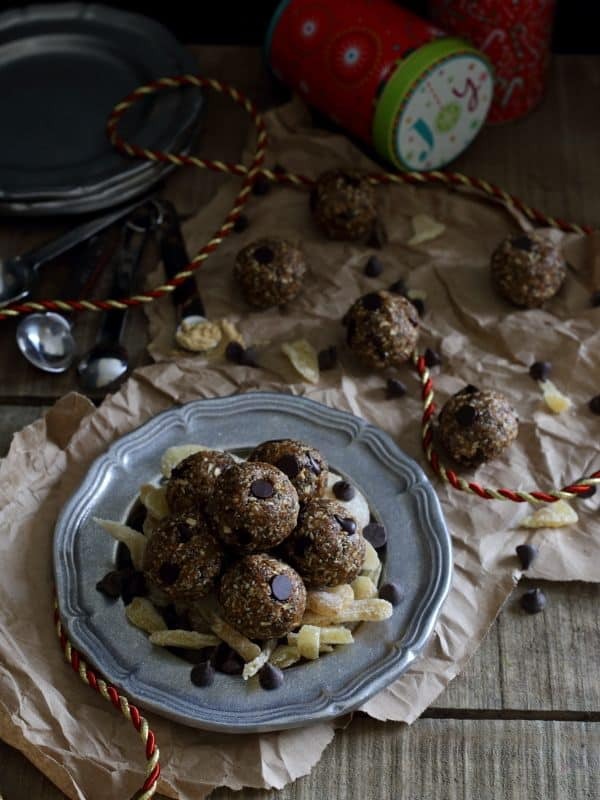 I am just loving how delicious and healthy these gingerbread and chocolate balls are.. perfect to counterbalance all the unhealthy Christmas treats I’m planning on having this upcoming week! Crystallized ginger is one of my favorite ingredients everrrrrr. These look awesome! And I can’t handle any more food coloring. Thanks for the recipe. Looking forward to the next.